Today we started a unit on feelings and emotions. Kids dont always know what they are feeling so they cry or lash out by hitting. Our job is to help them label the feeling so they can deal with it and then teach them how to process or handle that feeling. In circle time we practiced showing our feelings on our faces. Many times you hear that people wear their feelings on their sleeve when in actuality we wear them on our face. Have you ever said something and knew by looking at their face that they took it all wrong ? Helping children to realize they can do this too can make a huge difference in how they treat other people. If we don’t recognize we cant address the feeling. This week we will be doing a lot of singing about our emotions and as teachers we will be labeling the emotions as they happen in the classroom. And let me just tell you, in our seven hour day – we go through all of them. 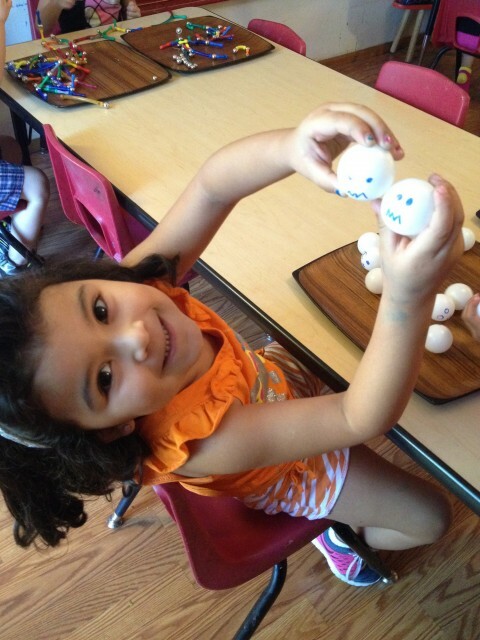 One of the activities we did today was matching faces on ping pong balls and labeling the faces. Many times we shut kids and their emotions out like they arent real. How did your parents handle strong emotions? Many times we find ourselves mimicking how our parents coped with feelings. Here is a clip that Dr. Becky Bailey made. Dr. Bailey is portraying the chlid that is angry. Watch the clip until the end when the mom coaches the child through the anger. Feelings – We all have them ! I am so glad Emily (Beall) is spending her days under your guidance and caring soul. Thank you! Thank you . We love her !